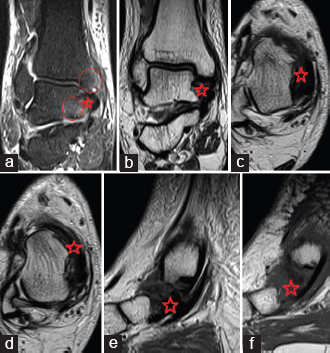 This study aimed to a ssess the role of MRI in the diagnosis of ankle impingement. Ankle pain is a common and frequently disabling clinical complaint that may be caused by a broad spectrum of osseous or soft-tissue disorders. Chronic ankle pain is a common complaint in orthopedic practice. Impingement syndromes are considered one of the most important causes of chronic ankle pain, which occur due to friction of the joint tissues. This prospective study included 86 patients (M/F = 60/26) with chronic ankle pain and clinically suspected to have impingement. MRI acquired on a 1.5 T scanner was applied for all cases. Different types of ankle impingement were observed: posterior ankle impingement (n = 34/90), anterolateral ankle impingement (n = 18/90), anterior ankle impingement (n = 8/90), anteromedial ankle impingement (n = 4/90), posteromedial ankle impingement (n = 2/90), entrapment neuropathy (n = 12/90), and sinus tarsi syndrome (n = 4/90). With the advent of MRI, detailed examination of the osseous and soft-tissue structures of the ankle is possible. Thus, MRI has opened a new horizon in diagnosis and hence in the treatment of most ankle joint lesions. Ankle impingement is defined as a painful mechanical limitation of full ankle range of motion secondary to an osseous or soft-tissue abnormality ,. Ankle impingement syndromes are caused by the friction of joint tissues, which is both the cause and the effect of altered joint biomechanics resulting in chronic ankle pain . From anatomic and clinical viewpoints, these syndromes are classified as anterolateral, anterior, anteromedial, posteromedial, and posterior . Careful analyses of patient history with signs and symptoms at physical examination can suggest a specific diagnosis in most patients. MRI is the most useful imaging method for detecting the osseous and soft-tissue abnormalities present in these syndromes and for ruling out other potential causes of chronic ankle pain . Despite conventional radiography being usually the first imaging technique performed to assess any potential bony abnormalities, soft-tissue affection usually escapes and it has disadvantages of improper assessment of cartilaginous, ligamentous, and tendinous lesions . Ankle pain can be associated with swelling, stiffness, redness, and warmth in the involved area. The pain is often described as an intense dull ache that occurs upon weight-bearing and ankle motion ,,. MRI has opened a new horizon in diagnosis and hence in the treatment of most ankle joint lesions. It enabled the detection of a wide variety of bone changes and a variety of disorders in soft tissues such as ligaments, tendons, and synovial membranes . MRI is particularly suited for the evaluation of complex bone and soft-tissue anatomy of the foot and ankle because of its superior soft-tissue contrast and the ability to image in multiple planes. In addition, new fast scan techniques provide improved efficiency and allow dynamic studies to be performed. The MR arthrography technique has improved significantly in recent years resulting in a more routine use of this technique as it allows the most accurate assessment of the capsular recesses . This study aimed to evaluate the role of MRI in the diagnosis of ankle impingement. This prospective study was conducted on 86 patients presenting 90 cases as there were four patients with bilateral chronic ankle pain. There were 60 male and 26 female patients and their ages ranged between 18 days and 56 years. Written informed consent was taken from all patients, and all of these patients underwent MRI study on a 1.5 T clinical scanner (Toshiba Vantage, Holt, Michigan, USA) using standard extremity coil with 12–16 cm field-of-view. 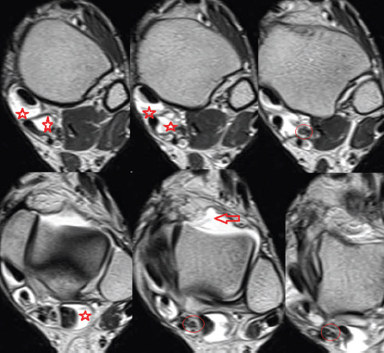 Conventional MRI consisted of axial T1-weighed image (T1WI), axial T2-weighed image (T2WI), axial PD fat sat, sagittal T1WI, sagittal T2WI, sagittal STIR, and coronal T2WI. Conventional MRI were analyzed for characterization of different disorders. Three groups were considered (impingement syndromes, entrapment neuropathy, and sinus tarsi syndrome). Different osseous and soft-tissue etiologies were demonstrated that altered the biomechanics of the joint leading to vicious circle of chronic pain. 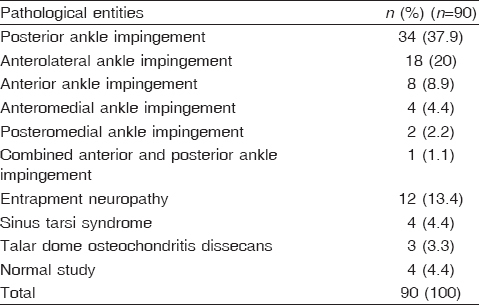 The included 86 patients [Table 1] (M/F = 60/26) presented as 90 cases were further categorized according to their pathologies as follows: impingement syndromes, entrapment neuropathy, and sinus tarsi syndrome [Table 2]. Their ages ranged from 18 days to 56 years with a mean age of 32 years. The peak incidence of chronically painful ankle in this study was observed in patients between 20 and 40 years, and the least affected were patients below 20 years of age. Male population was more affected compared with female population. Thirty percent of the scanned cases had a history of trauma (n = 27/90). Concerning the impingement syndromes, posterior ankle impingement was the most commonly encountered entity (n = 34, 37.9%) and the os trigonum was the most common causative agent representing 67.6% (n = 23/34) [Table 3]. The lowest incidence was observed for posteromedial ankle impingement (n = 2/90, 2.2%). For entrapment neuropathy, the posterior tibial nerve was the most frequently entrapped nerve (n = 8/12) and the tenosynovitis of the flexor tendon group was the most common causative agent. On comparing radiographic and MRI findings in the 90 scanned ankles, MRI yielded a sensitivity of 81.4%, specificity of 100%, accuracy of 100%, positive predictive value of 100%, and negative predictive value of 26.9%. On comparing clinical and MRI diagnosis in the 90 scanned ankles, MRI yielded a sensitivity of 89.2%, specificity of 100%, accuracy of 100%, positive predictive value of 100%, and negative predictive value of 41.2%. 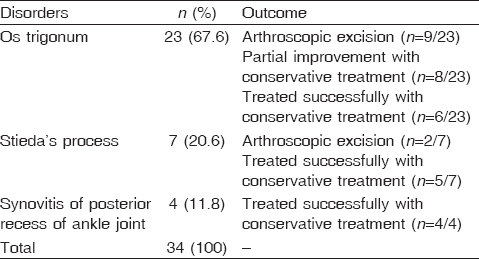 Concerning arthroscopic correlation, MRI revealed 100% sensitivity and accuracy (n = 13/90) [Figure 1],[Figure 2],[Figure 3],[Figure 4],[Figure 5],[Figure 6]. Figure 1: Case no. 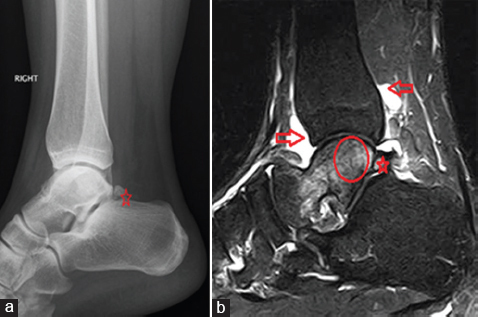 1: (a) radiography of the right ankle in lateral view and (b) sagittal STIR weighed image of os trigonum (posterior ankle impingement) asterisks, circle and arrow. Figure 2: Case no. 2: (a) sagittal T1-weighed image; (b) coronal T2-weighed image of sinus tarsi syndrome asterisks. Figure 3: Case no. 3: successive axial T2-weighed image of chronic proliferative tenosynovitis of the flexor tendon group and subsequent posterior tibial nerve entrapment (tarsal tunnel syndrome) asterisks. Figure 4: Case no. 4: (a) axial T2-weighed image, (b) axial T1-weighed image, and. (c) coronal T1-weighed image demonstrated poorly defined anterior talofibular ligament with a menscoid lesion of T1 and T2 intermediate signal intensity distending the anterolateral gutter. (asterisks) consistent with anterolateral ankle impingement. Figure 5: Case no. 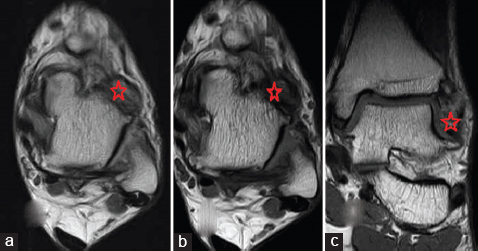 5: (a) coronal STIR, (b) coronal T2, (c and d) axial T2, (e) sagittal T2, and (f) sagittal T1-weighted images demonstrated poorly defined deep deltoid ligament with a menscoid lesion of T1 and T2 intermediate signal intensity (isointense to muscles) distending the posteromedial gutter (asterisks) with subtle marrow edema of the adjacent talus and medial malleulous (circles) consistent with posteromedial ankle impingement. Figure 6: Case no. 6: (a) radiography of the left ankle lateral view revealed osteoarthritic changes in the talonavicular articulation with marginal osteophytes, sclerosed articular surfaces, and joint space loss as well as subchondral cysts (circle). (b) Successive gradient echo-weighted images revealed osteoarthritic changes in the talonavicular articulation with marginal osteophytes, sclerosed articular surfaces, and joint space loss as well as subchondral cysts (circle and asterisk) encroaching upon the deep peroneal nerve (void arrow) within the anterior tarsal tunnel. Chronic ankle pain is a common complaint in orthopedic practice. The etiology of chronic ankle pain includes various pathologies such as impingement syndromes, entrapment neuropathy, and sinus tarsi syndrome. MRI is the most useful imaging method for detecting the osseous and soft-tissue abnormalities present in these syndromes and for ruling out other potential causes of chronic ankle pain . MRI is valuable when a global assessment of the joint requires evaluation of muscles, tendons, cartilage, and bone marrow . This work included 86 patients with chronic unilateral and/or bilateral ankle pain to evaluate the role of MRI in the diagnosis of ankle impingement. Thirty-four cases of posterior ankle impingement were diagnosed in this study. In agreement with the findings of Sofka  and Chiereghin et al. , the talus has a prominent posterolateral process when remains separate from the talus; this yields a separate os trigonum with a cartilaginous synchondrosis interposed between it and the posterior talar body. The posterolateral process can cause posterior ankle impingement syndrome because of repetitive stress on the os itself, the synchondrosis or both, or from an acute injury (fracture). Posterior ankle impingement caused by a prominent talar trigonal process, either a prominent posterior process of the talus (Stieda's process) or discrete separate os trigonum, is an often under-recognized cause of hindfoot pain. Twenty-three cases of os trigonum were diagnosed representing 67.6% of the posterior ankle impingement cases. Seven cases of Stieda's process were diagnosed representing 20.6%. Imaging is helpful in confirming the diagnosis of posterior (os trigonum) impingement as well as excluding other possible causes of posterior ankle pain such as sinus tarsi syndrome, tarsal coalition, entrapment of lateral branch of deep peroneal nerve, tendon injuries (Achilles and flexor hallucis longus), tenosynovitis, Haglund's syndrome, and tarsal tunnel syndrome. In agreement with the study by Bureau et al. , bone contusions of the lateral talar tubercle and os trigonum are prevalent MRI findings of posterior ankle impingement syndrome. MRI clearly depicts the osseous and soft-tissue abnormalities associated with PAI syndrome and is useful in the assessment of this condition. We had 11 cases with flexor hallucis longus entrapment out of the 23 cases diagnosed as os trigonum; this is in agreement with the study by Lo et al. , who stated that seven cases out of the 14 cases with variably sized os trigonum had flexor hallucis longus tendon entrapment that appeared as abrupt cutoff of the tendon synovial sheath fluid at the posterior talus. Clinically, the patients' chief complaints included posterior ankle pain, clawing of the great toe, and loss of full range of plantar flexion. In agreement with Duncan et al. 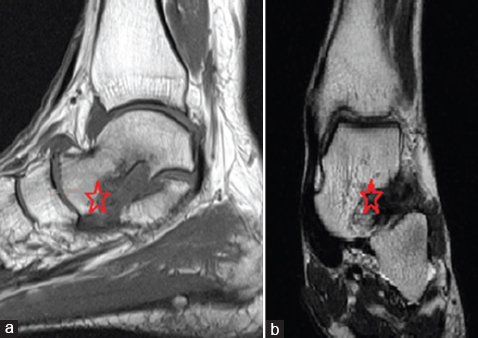 , concerning the usefulness of MRI in the diagnosis of anterolateral impingement of the ankle, the axial images were considered to be most helpful in making the diagnosis. Sensitivities varied from 0.75 to 0.83, whereas specificities varied from 0.75 to 1.00. We reported marrow edema related to the impingement syndromes of the ankle as Rios et al. has demonstrated calcaneal and posterior talar marrow edema in posterior ankle impingement, distal tibial, and adjacent talar marrow edema in anteromedial and posteromedial ankle impingement as well as distal fibular and adjacent talar body marrow edema in anterolateral ankle impingement. Pisani et al. had stated that MRI is the best method to visualize the structure within the sinus tarsi, especially the interosseous and cervical ligaments. In our study, we had four cases with sinus tarsi syndrome. This is in agreement with the study by Corazza et al. , who stated that alteration of the tarsal sinus fat with diffuse, low-signal-intensity infiltration on both T1WI and T2WI was observed in a cadaveric study with a history of foot pain. The transverse planes were of limited value in the evaluation of the tarsal sinus ligaments; they were essential to the identification of the adjacent supporting structures. In agreement with the findings of Lambert et al. , tarsal tunnel syndrome is a compressive neuropathy of the tibial nerve with multiple causes. This syndrome is difficult to diagnose and can be missed because of its subjective symptomatology. MRI can provide supplementary information to the electromyography and contribute to positive and etiologic diagnosis of peripheral nerve lesions. Anterior tarsal tunnel syndrome is a rare entrapment neuropathy involving the deep peroneal nerve beneath the inferior extensor retinaculum of the ankle and foot. This syndrome may be a clinically under-recognized entity, thus making a missed diagnosis and delayed treatment likely. Similarly, Huang et al. reported a case of a 53-year-old woman who for many years had experienced the clinical symptoms of anterior tarsal tunnel syndrome, including pain in the dorsum of the right foot with numbness radiating to the first web space. Roentgenograms of the foot revealed osteophytes on the dorsum of the talus as it articulated with the navicular bone. During surgery, the osteophytes were found to be irritating the deep peroneal nerve. After surgical decompression of the anterior tarsal tunnel, the patient had a significant reduction in symptoms. One year later, she was noted to be asymptomatic with normal physical findings. In our study there was a 49-year-old female patient known to have rheumatoid arthritis who presented with talonavicular osteophytes impinging the deep peroneal nerve within the anterior tarsal tunnel; this patient underwent surgical excision with postoperative symptomatic relief. Our study had limitations; our case group has been biased because most patients did not undergo arthroscopy or postarthroscopy MRI. MRI likely represented the cases in which the clinical diagnosis was not certain clinically and we believe that clinically confusing cases were precisely the ones that have achieved benefit from MRI. MRI is the modality of choice for optimal detection of most soft-tissue disorders of the tendons, ligaments, and other soft-tissue structures of the ankle and when global evaluation of the osseous and soft-tissue structures of the ankle is needed. This modality is also valuable in the early detection and assessment of a variety of osseous abnormalities seen in this anatomic location. Sanders TG, Rathur SK. Impingement syndromes of the ankle. Magn Reson Imaging Clinic North Am 2008; 16:29–38, v.
Donovan A, Rosenberg Z. MRI of ankle and lateral hindfoot impingement syndromes. Am J Roentgenol 2010; 195:595–604. Henderson I, La Valette D. Ankle impingement: combined anterior and posterior impingement syndrome of the ankle. Foot Ankle Int. 2004; 25:632–638. Thomas H, Malone TR, Lynn N. Musculoskeletal imaging companion. 2nd ed. BookHolders (gambrills, MD, U.S.A.); 2007. Dunfee WR, Dalinka MK. Imaging of atheletic injuries to the foot and ankle. Radiol Clinic North Am. 2008; 40:289–312. Chorley JN. Ankle sprain discharge instructions from the emergency department. Pediatr Emerg Care 2005; 21:498–501. Ivins D. Acute ankle sprain: an update. Am Fam Physician 2006; 74:1714–1720. Van Rijn RM, Van Os AG, Bernsen RMD, Luijsterburg PAJ, Koes BW, Bierma-Zeinstra SMA, et al. What is the clinical course of acute ankle sprains? A systematic literature review. Am J Med 2008; 121:324–331. Rosenberg ZS, Beltran J, Bencardino JT. MR imaging of the ankle and foot. Radiographics 2008; 20:153–179. Miller T. Common tendon and muscle injuries: lower extremity. Ultrasound Clin 2007; 2:605 –615. Sofka CM. Posterior ankle impingement: clarification and confirmation of the pathoanatomy. HSS J 2010; 6:99–101. Chiereghin A, Martins MR, Gomes CM, Rosa RF, Anti Loduca SMA, Chahade WH. Posterior ankle impingement syndrome: a diagnosis rheumatologists should not forget. Two case reports. Rev Bras Reumatol 2011; 51:283–288. Bureau NJ, Cardinal E, Hobden R, Aubin B. Posterior ankle impingement syndrome: MR imaging findings in seven patients. Radiology 2000; 215:497–503. Lo LD, Schweitzer ME, Fan JK, Wapner KL, Hecht PJ. MR imaging findings of entrapment of the flexor hallucis longus tendon. Am J Roentgenol 2001; 176:1145–1148. Duncan D, Mologne T, Hildebrand H, Stanley M, Schreckengaust R, Sitler D. The usefulness of magnetic resonance imaging in the diagnosis of anterolateral impingement of the ankle. J Foot Ankle Surg 2006; 45:304–307. Rios AM, Rosenberg ZS, Bencardino JT, Rodrigo SP, Theran SG. Bone marrow edema patterns in the ankle and hindfoot: distinguishing MRI features: Am J Roentgenol 2011; 197:W720–W729. Pisani G, Pisani PC, Parino E. Sinus tarsi syndrome and subtalar joint instability. Clin Podiatr Med Surg 2005; 22:63–77. Corazza F, Stagni R, Parenti-Castelli V, Leardini A. Articular contact at the tibiotalar joint in passive flexion. J Biomech 2005; 38:1205–1212. Lambert A, Ben Salem D, Regis A, Soichot P, Ricolfi F. Post-traumatic tarsal tunnel syndrome: interest of muscular MRI. Rev Neurol (Paris) 2008; 164:77–81. Huang KC, Chen YJ, Hsu RW. Anterior tarsal tunnel syndrome: case report. Changgeng Yi Xue Za Zhi. 1999; 22:503–507.